Posted on December 19, 2017 by Maya S.
In her new novel, American Street, Ibi Zoboi creates a different type of story which is both full of truth and meaning. The first thing I noticed when I picked up the book, however, was the names. And how much Zoboi was able to do with them. Our protagonist, Fabiola Toussaint, shares an inspiring story through narrated as well as journalistic chapters, and I loved all of it. Though not based on a true story, the author has taken the voice of each character and has written from their own fictitious hearts, almost as if she were interviewing them. Blending the American lifestyle of today’s Detroit and a coming-of-age teenager’s story from Haiti made for a truly extraordinary read. Not only does this message strike home for my beliefs, but it is truly and utterly relevant. Fabiola, conned ‘Fabulous’ by friends at school, was born in Haiti to a life supported by her American aunt. The story starts out as Fabiola leaves the airport without her mother, detained by the immigration officers. This vulnerability reaches the reader on a deep level. If this scene was cut from the novel, Fabiola would be treated as any other modern-day damsel in distress finding her way around twenty-first century Detroit. What makes her story so special was the way it spoke to the reader. It was unlike many other novels recently released, in that the reader felt something more than joy or sadness. At some point in one’s life, they will experience being in a new and unfamiliar place. Nothing seems to stop to allow one to catch up. It is as if nobody else cares. Zoboi captured this shared human feeling stunningly. On a scale of ‘one’ to ‘amazing’, I would definitely rate American Street ‘amazing’. Readers can also learn something new about cultures and their collision on the corner of American Street and Joy Road. 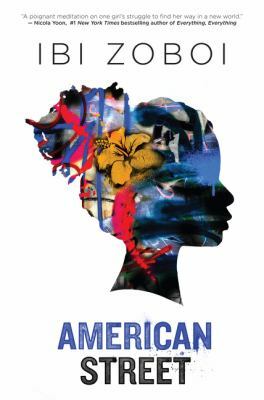 American Street by Ibi Zoboi is available for checkout from the Mission Viejo Library. This entry was posted in Book Reviews and tagged american dream, haiti, immigrants, relationships, ya fiction by Maya S.. Bookmark the permalink.